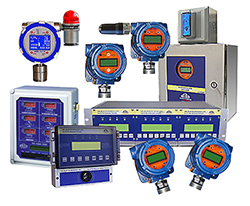 Gas Detector Placement | Mil-Ram Technology, Inc.
Mil-Ram gas detection systems monitor specified gases within the designated range of concentration. The properly maintained gas sensor is only capable of monitoring gas that is immediately present at the face of the sensor. The installation instructions and other recommendations offered by Mil-Ram are intended to provide basic guidance related to the operation of the equipment and potential effects related to environment. While this information may be useful in determining the number and placement of gas detectors, it should not be relied upon as the only source. It is recommended that the user consult with qualified safety professionals (e.g. industrial hygiene, environmental, etc.) to determine adequate number and placement of gas detectors for a given site and prevailing conditions. Industrial sites are often complex in nature and therefore, require proper analysis to make the best determination. 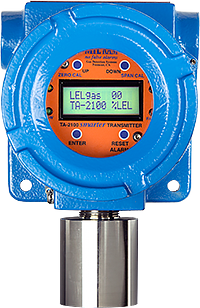 Regarding gas detector placement, a general guideline is to place detectors as close as possible to potential leak sources (valves, flanges, regulators, gaskets, compression fittings, etc) to provide early warning and acknowledgement of leak conditions. Additionally, it is recommended to install detectors moving away from the potential leak source, to track the movement of the gas and especially provide earliest possible warning approaching and including areas where workers may be present. For example, gas detector placement should include all populated areas, confined spaces, tunnels, adjacent structures and buildings. Detector placement is especially critical in safety related applications where personnel may be present. Other factors that influence detector placement include convection currents, ventilation, personnel traffic, location of machinery & equipment, gas vapor density, etc. Qualified, on-site safety personnel that are most familiar with the specific environment and related processes under varying conditions, over extended periods of time, are often critical to determining the number and placement of gas detectors. Mil-Ram can only offer general guidelines as a starting point for consideration. The final determination regarding the number and placement of gas detectors must be made by the end user and take into account their own unique site, operational and safety requirements and company polices. Safety critical applications require the most careful attention.